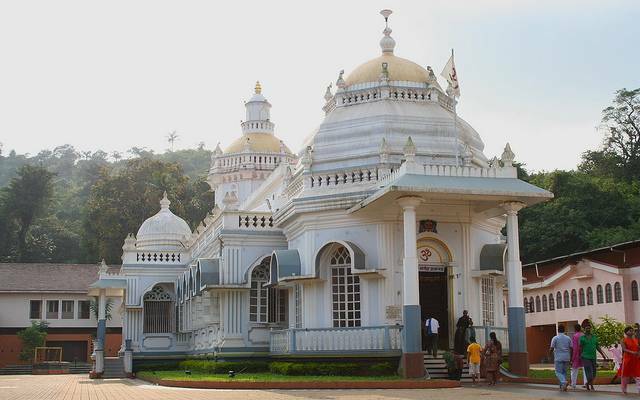 Mangeshi Temple or Mangueshi Temple is located in Ponda, Goa about 25 kms from Margao and 23 kms from Panaji. It is a temple dedicated to Lord Manguesh, an incarnation of Lord Shiva and is an important local deity of Goan Hindus. The temple is about 400 years old and is a beautiful, sprawling temple. This is one of the largest temples in Goa and one of the most popular one. Mangeshi Temple is peaceful temple is located atop a hill and is surrounded by lush greenery. A tall seven-storied lamp tower (or deepstambh) is also in the temple premises. The temple attracts a lot of devotees on every monday and also during festivals such as Ramanavi, Maha Shivratri, Diwali and Magha Poornima.